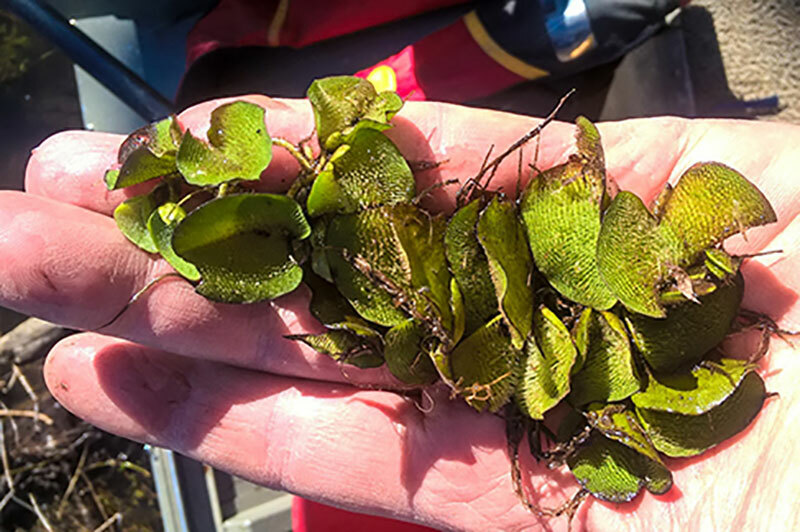 ATHENS, Texas – The Texas Parks andWildlife Department has confirmed the presence of giant salvinia in ChaneyBranch on Lake Fork. The infestation appears to be confined to this branch andanother small cove west of the dam and occupies an estimated 3.25 acres.Judging by the distribution and age of the plants, it is apparent it has beenin place for several months. As is the case for other introductions in EastTexas, the plants were most likely introduced to the lake by boat trailer. 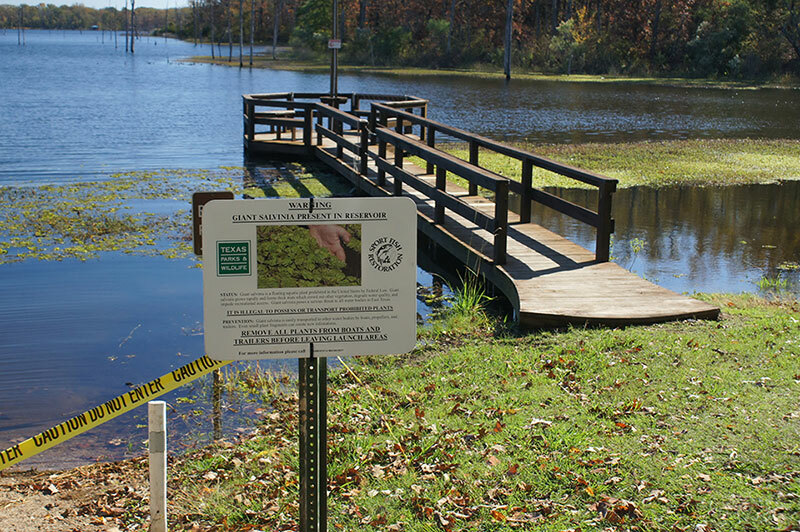 Lake Fork’scontrolling authority, the Sabine River Authority (SRA), immediately closedboat ramps at Chaney Point South and Secret Haven, which are located at thewesternmost end of Chaney Branch, in order to eliminate any further risk ofspreading this invasive plant. The SRA has also conducted reconnaissance atbridge crossings and conducted shoreline surveys by boat to look for additionalinfestations. Crews fromthe SRA and TPWD have physically removed salvinia plants and placed them ingarbage bags for disposal. Additionally, crews have placed approximately 1,100feet of floating boom across the creek, containing the infestation within the90-acre cove. SRA staff hasalso installed a floating sign and lights to alert boaters to the presence ofthe floating boom. TPWD staffwill be conducting a chemical treatment using glyphosate. All effortswill be made to protect beneficial aquatic plants while focusing treatment onkilling the invasive giant salvinia. TPWD will continue to conduct additionalsurveys to check for the spread of the plant to other areas of the lake, andadditional physical removals will be done if necessary. Efforts toincrease public awareness will be increased by installing warning signs atmajor boat ramps. Boaters and property owners are urged to clean, drain, anddry their boats and trailers in between trips. Giantsalvinia is a floating fern native to Brazil. It reproduces by budding andspreads easily by the movement of wind and water currents. Giant salvinia growsrapidly and can double in coverage in a week. Uncontrolled, giant salvinia canimpede navigation, block sunlight from reaching the water and hamper fishing. This incidentis a painful reminder of the importance of cleaning all plant material fromyour boat, trailer, and towing vehicle and draining your boat before leaving alake. Transportation of aquatic invasive species is illegal in Texas. For moreinformation on giant salvinia and other invasive species, visit //www.texasinvasives.org/.